ALBUQUERQUE, NEW MEXICO— “I think she’s famous in Egypt,” the women wearing glasses from Dixon, New Mexico said to me, almost in a whisper. 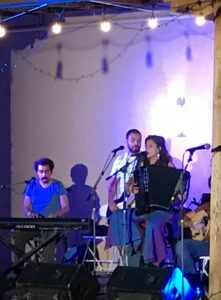 Along with my wife, brother, and several hundred people, we watch singer, accordionist, and songwriter, Youssra El Hawary, perform at the Hispanic Cultural Center for ¡Globalquerque!, New Mexico’s largest world music celebration. “I saw her perform last night on the main stage,” the woman continued, “and told myself, I need to come back and hear her again. She may even have something to do with the Egyptian revolution,” she said with a curious smile. The woman’s words caught my attention. 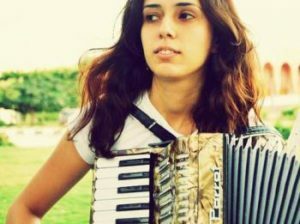 I listen to El Hawary’s performance, enjoying the songs, the musicianship (accordion, drums, keyboard, guitar, bass, recorder, bouzouki, etc. ), and the stories (most about life in Cairo, Egypt: buses, relationships, and life). I only know what the lyrics are about because El Hawary tells the audience; she mostly sang in Arabic but spoke clear English in between songs. From El Hawary stories, I knew I needed to learn a little more about her. I caught up with El Hawary after her concert to gain insight about her music. I ask her what she did prior to becoming a full-time musician. “I’ve been a musician for a while. But before committing to music full time, I was a radio personality in Egypt. I hosted a popular program, but left for France for two years to learn accordion. I’ve been professional musician since that time,” she says while signing a CD for me. We converse more. I learned that Youssar El Hawary has been writing songs since her early 20’s, tackling political and personal themes. She found a popular audience in Egypt in 2012 when her song El Soor (The Wall) became a musical declaration concerning the Egyptian Revolution, the Arab Spring. El Hawary was also the first Egyptian to finance the production of an album through crowdfunding, releasing No’oum Nasyeen in 2017. To say the least, her music is wonderful, as she appeared in person—petite, articulate, thoughtful, and thankful. 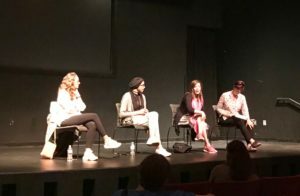 What the Egyptian women were sharing paralleled much of what we’re experiencing in the United States, a general distrust of both politicians and news. 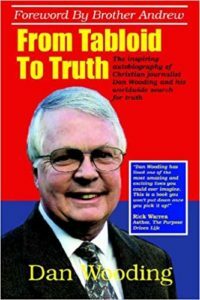 I resonate with the description “political fatigue.” I sat in rapt interest. 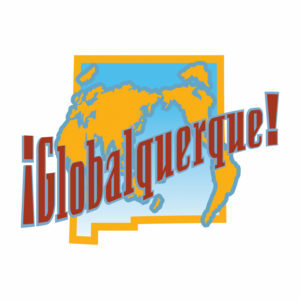 But Egypt was not the only country represented at ¡Globalquerque!. 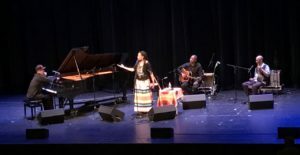 Musicians from Turkey, Korea, Guadeloupe, Ireland, the Republic of Congo, Cuba, Mexico, Ecuador, the US, and Brazil were all present, giving ¡Globalquerque! an international atmosphere. 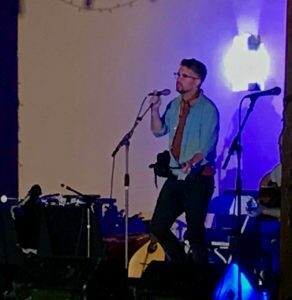 Not only was I impressed by Youssar El Hawary, but Irish piper Jarlath Henderson, and American Martha Redbone. There was so much great music at ¡Globalquerque!, opulent overload was my response. In addition to the lectures and music, movies were shown. I was able to watch two: Alma: Arte, Legado y Medio Ambiente (Spain), following musicians performing at a beautiful Spanish monastery, La Ribeira Sacra in Galicia, and Hombre de Barro (Columbia), shadowing musicians as they record music in the Amazon. I was particularly thankful of the movie Alma for introducing me to Portuguese Fado singer, Cristiana Aguas.